Spring in Ticino (Switzerland)? Enjoy the first warm sunshine of the year and experience the Mediterranean flair in the most beautiful part of Switzerland. Beautiful apartment on 2 floors. For rent by owner: Apartment on 2 floors with 3 bedrooms. The apartment is in a mansion in Golino. Golino is still intact, romantic Ticino village and is located at the entrance of the magnificent Centovalli, a stone's throw from Locarno and Ascona. In spring, the beautiful walks along the lure Melezza or Maggia. And in no time you are on foot in Locarno or Ascona. On the lower floor there are 3 bedrooms with double beds (2 x 160 cm, 1 x 140 cm) and the bathroom with a spacious walk-in shower. 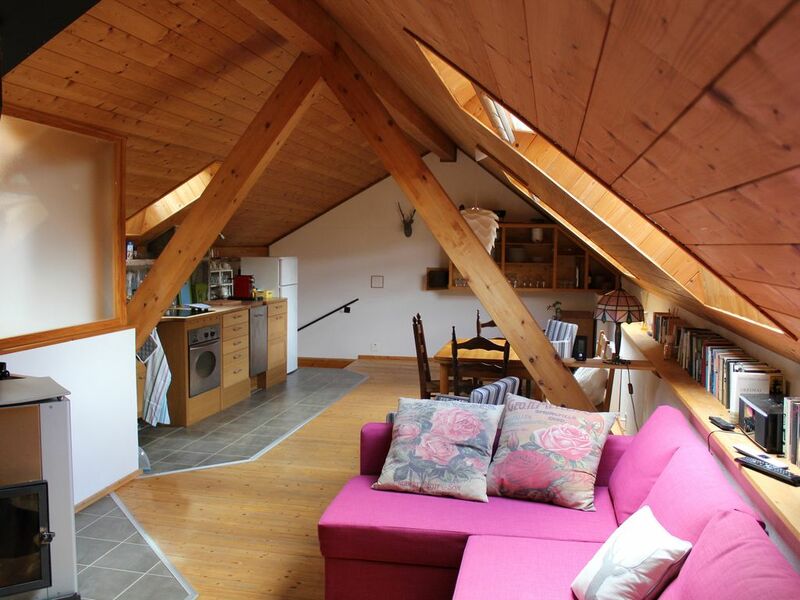 In the attic is the cozy living room with kitchen and dining area over 60 m2. The living area has two air conditioners, it should be very hot. In the colder season they serve as heating. The wood stove in the living room also provides warmth. The kitchen is equipped with ceramic hob, dishwasher, large fridge and all modern tools. The dinette can accommodate up to 8 people. The price includes all costs such as electricity, water, bed, bath and kitchen linen already included. WiFi in the whole apartment. From now on, the beautiful courtyard is available to guests (was previously a restaurant). In summer you live in the romantic courtyard on the ground floor. Equipped with tables, deckchairs and various seating. Spend cozy hours sunbathing, reading, eating, picnicking, lazing around. The communal kitchen on the ground floor is available to all guests. Do you want to take care of yourself or be spoiled by us? Upon request, we offer in the courtyard table grill, Mongolentopf (fondue chinoise) or raclette. We also spoil you with a rich breakfast. Ask. Locarno and Ascona offer numerous events such as Moon and Stars (music festival), film festival, chestnut festival, concerts, exhibitions etc. We found the apartments to be much more spacious, bright and soigné than could be perceived from photos. The house helps you to meld into tranquility of astonishing Golino. Merci vilmal & najlepša hvala! Beautiful part of Switzerland--beware of church bells! This was a really nice layout for a VRBO the three rooms all have real beds and fit our family of 5 well. The rooms had lots of windows opening to beautiful landscapes. We tried sleeping with the windows open but there are three churches surrounding the property that chime bells all night so it may take a night to adjust. Personally I loved them. As for the hosts, we arrived after 11:00 pm and had not eaten. The owners, who live downstairs, own a restaurant in the ground floor and they whipped us up some delicious (pricey but delicious) food. That was very nice of them. As for the location, it is well outside the bustle of Locarno and the peace and quiet was awesome. Lots and lots of areas to explore. We loved our stay! Trotz des eher älteren Gebäudes (sensationell) ist die Ferienwohnung sehr modern und geschmachvoll eingerichtet. Sie liegt zentral und bietet einen schönen Ausblick. Besonders angenehm war für mich diese Ruhe. Insgesamt, alles Top Schweizer Qualität! Wir danken Ihnen Frau Natalia und Antonio, dass wir bei Ihnen Gäste sein dürften. Wir versprechen es nicht, aber wir kommen wieder. Wir Grüssen Sie herzlichst und nochmals vielen Dank. Die Familien Lemis & Nicolas, mit Kinder Nadine, Sebastian (von Horgen) und Kamil mit Frau Ivana und die Kinder Erik und Patrik (aus Prag). vielen Dank für die schöne Bewertung und ihre Ausführungen. Sie ist uns Motivation und Ansporn. Gäste wie Sie bereichern uns und sind der Dank für unsere tägliche Arbeit. Wir freuen uns natürlich, Sie wieder bei uns begrüssen zu dürfen. Golino is located on the entrance of the magnificent Centovalli. Hiking and walking trails start on the doorstep. The emerald river is Melezza is on foot in a few minutes.